Samsung Group scored a victory over rival Apple Inc in their long-running dispute over mobile device patents after a US trade agency issued an order banning older but still-popular Apple products like iPhones and iPads from the US market. The US International Trade Commission (ITC) ruled on Tuesday that the Silicon Valley giant had infringed on a patent owned by Samsung Electronics that involves the ability of devices to transmit multiple services simultaneously and correctly through 3G wireless technology. or sale of the iPhone 4, iPhone 3GS, iPad 3G and iPad 2 3G distributed by AT&T, the biggest seller of Apple devices in the United States when Samsung filed its complaint in 2011. The products are assembled in Asia. US President Barack Obama has 60 days to review the ruling. If he does not veto the order, it will go into effect. It is not immediately clear what the impact could be on Apple or AT&T should Obama let the ruling stand, since the decision remains subject to a potentially prolonged appeals process. While the products targeted are more than a year old, some models such as the iPhone 4 remain solid sellers. The most recent version covered by the ITC's decision - the iPhone 4 - is now given away with a contract offered by carriers including Verizon Wireless, which is not affected by the ruling. The iPhone 4 could be phased out within a year should Apple stick to schedule and release a new version of the iPhone 5 in the fall as many in the industry expect. Still, if the import ban goes into effect, U.S. customs agencies enforcing the ban could well end up delaying other Apple products, said Susan Kohn Ross, a partner in the Los Angeles office of Mitchell Silberberg & Knupp. "This is going to create a huge distortion for Apple," she said. "Customs has a very difficult job now. They have to look at every shipment." The iPhone accounts for about half of Apple's revenue. While the company doesn't disclose sales data on individual smartphones and tablet models, the most current version of the iPhone typically accounts for the biggest chunk of iPhone shipments of more than 100 million units annually. Shares in Apple were little changed at $446.26 in after-hours trade. Samsung stock was also holding steady at about 1.54 million won. Apple has waged an international patent war since 2010 as it seeks to limit the growth of Google's Android, the world's most-used mobile software today. That fight has embroiled Samsung, HTC Corp and others that use Android, a direct competitor to Apple's iOS. Tuesday's ruling overturned a decision by ITC Judge James Gildea, who ruled in September that Apple did not violate patents at issue in the case. Samsung, which is battling Apple in court in some 10 countries, had also accused Apple of infringing on three other patents, but the ITC found that Apple did not infringe those. "We are disappointed that the commission has overturned an earlier ruling and we plan to appeal. Today's decision has no impact on the availability of Apple products in the United States," Apple spokeswoman Kristin Huguet said in a statement. 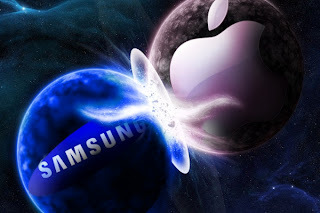 Samsung said the ITC decision "confirmed Apple's history of free-riding on Samsung's technological innovations." The Obama administration has been pressing for infringement of "standard essential patents" to mostly be punished by monetary charges, not sales bans. It reiterated that stand on Tuesday with a White House statement that - among other steps - urged the ITC to raise its bar for order sales bans so that it matches district courts. Designed to be a trade panel, the ITC has become a popular venue for patent lawsuits because it acts relatively quickly and it can order import bans, which are more difficult to get from district courts. While the ITC was created to ensure that U.S. companies got a fair shake competing against imports, a fair number of non-U.S. companies have filed for relief at the agency based on the fact that they have U.S. manufacturing plants or do research in this country. Samsung has a manufacturing plant in Austin, Texas. "I can't really point to any time that the foreign complainants or respondents got anything but a justice-is-blind fair shake," said one patent expert who spoke privately because he did not have permission from his firm to speak to the media. ITC cases can be appealed to the U.S. Court of Appeals for the Federal Circuit, and from there go to the Supreme Court. Apple has a parallel complaint filed against Samsung at the ITC, accusing Samsung, an Apple chip provider, of blatantly copying its iPhones and iPads. An ITC judge in that case found that Samsung had violated one patent but not a second one. A final decision is due in August.